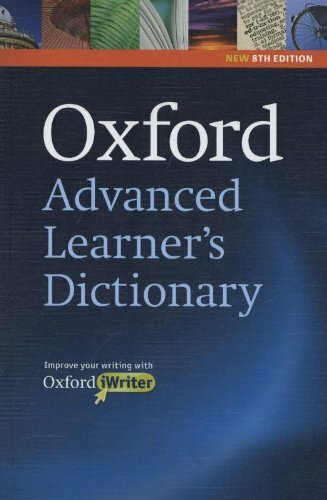 Oxford Advanced Learner’s Dictionary 8th Edition 2010-This is the world’s bestselling advanced learner’s dictionary, recommended by learners of English and their teachers, and used by 30 million people. NEW 32-page Oxford 3000(t) Vocabulary Trainer, only available with the Paperback and CD-ROM edition. Truly a joy to use. It has to be the most user-friendly, information-sensitive dictionary available for the upper-intermediate to advanced English learner. The only dictionary a typical language student would ever need. Being up-to-date and bursting with fun new expressions. Last edited by arcadius; 11-02-2017 at 11:25 PM. Thanks nasa for sharing but please next time center your image cover. After installing copy the content of Oxford Advanced Learner's Dictionary Crack in your folder of choice (usually C:\Program Files\OALD8) and replace it with cracked one. Thanks for sharing and I think this would be one of the best software dictionary. "Please insert the Oxford Advanced Leaner's Dictionary CD-ROM to access this feature"
appears when I click on the "Oxford Advanced Leaner's Dictionary" icon. Can anyone please help me? For francesco and all other who face the problem when registering program: Crack only added to the header. Manual: Within RAR archive is crack called oald8.exe. Open the file with your RAR Archiver, WinRAR for instance. Go where the program is located, usually C:\Programs Files\OALD\OALD 8 or similar. Now drag and drop oald8.exe to the folder. Replace existing oald8.exe with this one. It will inform you that such file exists and that existing will be overwritten. Answer YES. Exit WinRAR. Now, your program is fully registered. Last edited by arcadius; 11-02-2017 at 09:47 PM. Could you upload the crack file again?